There have been several books written over the past decades discussing the impact, scope, and origin of the 1918 influenza pandemic and each book takes the narrative a little farther and a little deeper while unraveling more of the mystery of the virus that possibly killed 100 million humans. 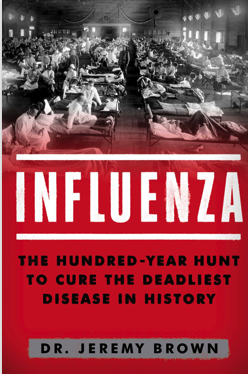 Laurey Spinney's Pale Rider: The Spanish Flu of 1918 and How it Changed the World is the latest book to appear on this topic and it adds considerably to the understanding of the global catastrophic biological risk of influenza. In this book, Spinney blends tales of incomprehensible rates of illness with new data that peers back through the molecular clock to understand the origin of this deadly virus. Most people know the story of the utter calamity the flu pandemic and the futility of medical treatments in an era when the viral origin of the infection was not yet known. All of this is covered in great detail in the book but, to me, the chief value of the book was its discussion of how this outbreak started. I will just highlight this portion of the book's narrative in this post. 1. Camp Funston, Kansas: This is one of the most favored hypotheses. On March 4, 1918 an army cook fell ill with what sounds like a classic case of influenza. The camp was soon inundated with cases and the pandemic seems to follow a linear path from that time and location. It is speculated that the congregation of American solider recruits from rural areas around the country facilitated the emergence and global spread of this virus along WWI routes. Haskell County in Kansas was noted to have a severe flu-like illness outbreak in January of 1918 and, perhaps, a recruit from this area made his way to Camp Funston. Molecular analysis shows that 7 of the 8 1918 flu genes come from a North American avian flu virus. 2. China: Contemporaneous with the flu, there were reports attempting to link the outbreak to a prior appearance of what was believed to be pneumonic plague in the city of Harbin in China. This illness first appeared in 1910 and again in another city (Shansi) in the winter of 1917 and though it was reported that the plague bacilli was isolated from cases there is some doubt whether it actually was. Indeed some physicians at the time described it as a severe influenza-like illness. It is hypothesized that members of the Chinese Labor Corps (CLC), a secret Chinese effort to help the Allied war effort, brought the infection to the European front as well as to North America. "purulent bronchitis" consistent with influenza occurred. According to this explanation, the virus moved through pockets of people, strengthening, until the major outbreak occurred over a year a later. The book contains a treasure of information that adds considerably and updates existing literature on this pandemic. It has been 100 years since the pandemic of 1918 and, since that time, there have been 3 subsequent pandemics yet 1918 dwarfs them all. For those of us in this field, the next flu pandemic (and probably the next and the next) are a foregone conclusion and understanding as much as possible about 1918 can only help us prepare. Pale Rider is a book that is highly valuable for that task and I unequivocally recommend it. In the midst of the current flu season -- which is likely one of the worst in over a decade with the exception of the pandemic in 2009-10 -- there has been a lot of discussion regarding the benefits of Tamiflu (oseltamivir), the only oral antiviral indicated for the treatment of influenza in the US (the adamantane class of antivirals is virtually obsolete due to widespread resistance). Thus far there have been at least 37 pediatric deaths with more sure to come. I am a liberal user of Tamiflu and I hope to help people understand why in this post. Tamiflu, which was FDA approved in 1999, is an antiviral that blocks the ability of the virus to release from cells -- it inhibits the viral neuraminidase enzyme. It is given twice daily, for 5 days. In multiple randomized clinical trials, such as this one, it has been shown in healthy adults to diminish the duration and severity of symptoms when given within 48 hours of symptom onset. This type of clinical use is non-controversial and very well accepted. However, the controversy begins -- and it is impossible to describe all its nuances in a simple blog post -- when treatment is done outside of the 48 hour window or when the purpose is to diminish complications of influenza such as otitis media, pneumonia, hospitalization, ICU admission, the need for mechanical ventilation, and death or to diminish contagiousness. What fuels the controversy? To me, I think there are several reasons. One is the fact that people fail to realize that a trial in healthy adults with uncomplicated flu isn't designed to study the cascading impact of influenza -- they were designed, primarily, to look at symptom duration and severity in uncomplicated flu in low-risk patients. is the fact that people are trying to extrapolate trial results and trial populations outside of their proper realm. The 48 hour window cannot be applied with the same confidence to a pregnant woman, an immunocompromised person, an infant too young to be vaccinated, or a person with chronic illness such as asthma, COPD, or the like. During 2009 H1N1, it was shown in retrospective analysis (which may fall short of the gold standard randomized control trial but is nevertheless something that still provides valuable information) that receipt of Tamiflu correlated with outcome in severe influenza in multiple studies such as this one. Ideally, these people should be treated as soon as possible but benefit may still accrue with later treatment. Unfortunately, many healthcare providers don't know these risk groups well and many people who could benefit from antiviral therapy are overlooked. Those without risk factors can also benefit from Tamiflu, especially if given early in the course of illness. The side effects of Tamiflu, in my experience, are generally mild and involve nausea and vomiting and are outweighed by the benefits of treatment in most cases (and can be treated anti-nausea medications). However, I have seen some parents complain that children do not like the taste of the suspension and question the need for Tamiflu. If taste is the issue, capsules can be substituted and, if the child cannot swallow them, they can be opened and the contents put into a substance of choice (ice cream, pudding, etc). Optimizing the treatment of seasonal influenza is an important task that is all the more important in a moderately severe season. It will be of enormous importance during the next pandemic and familiarity and comfort among the patients, parents, and healthcare providers is essential for the population to be best equipped for that eventuality. There is always speculation about particular compounds that exist naturally in the wild that may have benefits for human health. Indeed, history is full of stories like this from quinine to aspirin. New research from Emory shows that frog mucus contains a potentially flu-fighting antimicrobial peptide. For the study peptides contained in the mucus from Hydrophylax bahuvistara frogs were screening for both anti-influenza activity and non-toxicity to human cells. Of these screens, one peptide, named urumin, emerged as the leading candidate. Urumin was noted to interact directly with the influenza virus at an important site: the conserved stalk area of the H1 hemagglutinin. Because it is a "conserved" region (i.e. one not highly mutable) the frog peptide retained activity against drug-resistant variants. This region is one of the targets of the long sought after universal flu vaccine. In the study, urumin worked not only in vitro but also in a mouse model. The peptide was specific for just H1 variant influenza A viruses. I found the paper to be very interesting and the discoveries may have wide-ranging implications not only for novel antivirals but for understanding influenza. As the authors note, innate defense mechanisms are less likely to be prone to resistance because they presumably were selected via natural selection for their durability against their target. It is unclear what role amphibians have with influenza A epidemiology but it appears they can be infected and perhaps urumin is one of its natural defenses against the virus. Future studies with ferrets will be important to perform as they are important surrogates for humans.